Who of us has not said, “Oh, if I had only listened to my intuition!” Failing to follow advice freely given, we fall into a ditch on one side or miss an opportunity on the other. And there are those happy times when we do just as we “knew” we should – we follow the advice of the, “Still Small Voice” and see questions answered and situations turn out for the best. Intuition. Few argue about its existence, though debate rages as to its authority, authenticity and origin. But what is it? Could it be true that extra-ordinary guidance is available to soccer moms and dads – to work-a-day people with no particular interest in psychic phenomenon? Part of the answer to these questions – the part this article will focus on is that intuition is not “extra ordinary.” Can this statement be supported? Yes, just as easily as I made it. Proof comes from the fact that everyone has had an intuitive moment – an unmistakable, intuitive experience. Something that everyone has experienced simply cannot be said be, extra-ordinary. Intuition, however difficult it might be to explain, is common. Its commonality is the proof needed to call it ordinary, as compared to things extra-ordinary! Intuition… wonderfully and quite simply, ordinary! Our feelings change when speaking of pre-cognition or prophesy. Hearing these words, people distance themselves, emotionally, and literally. Even in our Post Modern, Oprah, Super Soul Sunday, influenced society, I’d guess that a person who claimed prophetic abilities, would see business colleagues pull back and grow quiet – possibly wondering if their trust in this person needs to be re-considered! It’s a shame to think that claims of pre-cognition, prophesy or good old fashion E.S.P. could cost a person their reputation. Particularly as we come to realize that they amount to – are the same as intuition! Four terms – one is near universally admired – three could get you fired! Even though when examined, each one refers to the same natural ability. We’ll just call it, intuition. Then again, recognizing the awesome power of intuition should make the hair on our arms stand up. Natural as intuition is, the reason it exists and the way it works will probably require us to expand our definition of the word, “natural.” A couple of thousand years ago, East India’s sages wrote and taught of what they called “Indra’s Net.” Today, theoretical physicists call it quantum non-locality – I think. Actually I am no more sure of the correct, “Quantum Theoretical,” term than anyone is about anything concerning the quantum world. So let’s stick with Indra’s Net. For now, be excited and be nervous. If my intuition is correct, “Intuition” is about to rock our world! Stepping out, experimentally, consider intuition to be a bridge humanity is crossing from a world that is familiar and predictable to another – the same world, really, but seen correctly possibly for the first time. The world is not changing, we are. How we see the world has everything to do with how we think. How we think about the world and ourselves changes what we think – our priorities and goals – everything we consider necessary and possible. Suddenly, we inhabit a very different, very new world! Intuition looks much like what is referred to as omniscience – to be all knowing – in possession of all knowledge. Thought for now and even for those who have honed intuitional skills – what is known is limited. And what will be known at a given time cannot be predicted. At the same time who can predict how far intuitions access to information could reach? This is but one of the implications of the statement, “We are spiritual beings having a human experience.” If this is true – the “weight we place on the spiritual being side is the measure of our access to the infinite. Are you merely, occasionally intuitive? Or are you potentially omniscient? Remember – this is speculation. But we are speculating with a certain reasonable structure. “If this then that – if that then…” For most of us, intuition in an ability, a sense we cannot control – How much we are ultimately capable of intuiting and when this knowing will present itself are things we do not know. So we begin our walk across the bridge from the known to that which is only partially known. Said again in a slightly different way, this natural ability is also not known to be limited. From this position of unknowing we can say – intuition is potentially unbounded – the condition we call omniscience. Could it be true that the world does not impose limitations on us – that we impose limitations on the world, and in this way, upon ourselves? What does your intuition tell you? As we become comfortable using this sixth, natural sense… insight will deepen. How far does this natural knowing extend? Again… what does intuition tell you? 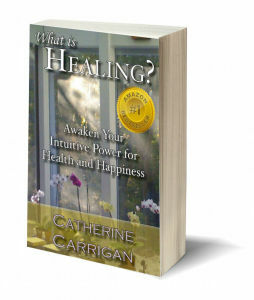 Catherine Carrigan is an author and medical intuitive. She also teaches people to use intuitive ability. In the short article that follows, (her book is considerably longer! ), Catherine tells the story of the problems that can occur when an unusual talent begins to bloom in a person’s life. For Catherine it was intuition. Given the “age” in which she grew up, intuition was even less well understood… definitely not an ability parents cheered like learning to ride a bike or read at an early age. Catherine now informs readers and her clients that intuition is available to everyone. For some of us, highly detailed and accurate intuitive knowing comes without practice or even conscious intent. Turning to the dread, Sports Metaphor… Intuition is like basketball. There are people like myself who dribble poorly, who rarely manage a successful shot at the basket. And there is Michael Jordan. As regards intuition, I am “Me,” and Catherine is Michael Jordan. But intuition is also – totally – not like basketball. Some people are born into this life with great intuitive skills, while others are oblivious or maybe just mediocre. But just as with most aspects of spiritual development, with commitment there is potential for much improvement. With practice – a lot of practice – it’s conceivable that I could function at a level comparable to Catherine’s. Believing that this is true, but not true yet… this article offers readers encouragement, not specific instruction. Catherine’s book provides help for those who, wishing to improve their ability, are looking for this kind of guidance. I’ve written this article to help readers understand that intuition is normal. So, taking a step farther, it could be said that to live without accessing intuitive ability is not normal. This is not a good time to fall behind as concerns intuition. Our understanding of this world – the view that people share is rapidly changing. This means that what we do, as well as why and how we do things is changing. Though the outcome is neither known nor completely predictable, these changes are not random. For now, let’s ask ourselves, “What if wireless communications were one day eclipsed and replace by intuition?” Imagine the possibility that the electronics of wired and wireless communication would be seen as primitive. The pieces are already in place. We call them People! The human spirit, mind and body. Is it possible that one day our access to intuition will evolve, such that the subtle senses of the human “being” will become the “World Wide Way,” the way people access information and talk with one another across this planet – or between earth and who knows where else? What if intuition is actually the internet of tomorrow? Some would say that the “Handwriting is already on the wall.” I’m suggesting that the text message is already on your screen! More to the point, I and who knows how many others think it’s possible. Therefore… it probably is! There are so many examples of science fiction becoming science fact! So, now that we are thinking and writing about the Internet of the Mind – one day, in a body/mind, possible even your own – we may see these ideas put into service. Could this be true? What does your intuition tell you? Sometimes people ask me when I first discovered my intuition. I could go back and I could go back but here’s the first story I can remember. When I was growing up, my family lived in England. Specifically, we lived in Hampstead right outside of London where my father was completing his residency as an eye surgeon. At the time, I was six years old and my little brother was three. That year, when it came time for my little brother to celebrate his third birthday on April 24, my parents decided to host an Easter egg hunt for the local children. The eggs – including a golden egg – were carefully hidden in our back garden. During the hiding of the eggs, my brother and I were instructed to hide inside the house, which we did. The day of my little brother’s party, all of us kids were kept in the house and at a certain time the glass doors were opened and we were all let out into the back garden to hunt for our eggs. The other little children went running hither and yon carrying their egg baskets. I remember walking right directly to a large tuft of tall grass and immediately picking up the golden egg, first thing, unprompted, within maybe 60 seconds of being let out into the back garden. What followed was a series of recriminations. My parents accused me of watching when they hid the eggs. But that actually wasn’t true. Even though it wasn’t true and even though I was not then and am still not a liar, I got spanked anyway (I was always getting spanked). Accessing our intuition is just like this. You focus, and the truth is revealed, even if you can’t actually see the golden egg hidden in the tall tufted grass. It was many years afterwards – decades in fact – before I recognized that I used my intuition at my little brother’s birthday party, but in a way that’s OK because the story shows me that I have always been intuitive, that I must have been born this way and that indeed the golden egg was not the Cadbury chocolate kind – no matter how yummy – but recognizing this gift in myself. Catherine then asks readers to consider: “Do you have a golden egg inside of you?” The answer is, “Yes!” Better than yes – it’s already hatched! How can we be so sure? Because as we have explored in this article, intuition is already at work in the life of everyone. The only question is, “Are you paying attention?” Catherine’s fellow intuitive, Caroline Myss insists that many people are so totally intuitive that they are to frightened to act. Her premiss is that these people don’t need to learn the skills associated with intuition, they need to learn to stop resisting the information that is flowing from them like water from a fire hose! This might be an exaggeration, but as I consider my reluctance to do what I know to be possible for me… I wonder! “… you may enjoy one of my recent Amazon No. 1 best sellers, What Is Healing? Awaken Your Intuitive Power for Health and Happiness. In (this) book, I explain the different kinds of intuitive gifts and how you can develop these skills in yourself to do medical intuitive readings. What is healing? Healing happens when we recognize that the golden egg is inside of us, just waiting to be discovered and enjoyed! ← Peace in Jerusalem… and Gaza Too?